Today is all about motion. There has already been hiking – and there will be boating, golfing and biking. Together with my sister and two wonderful friends, I am participating in Alzheimer’s Association The Longest Day, which involves 16-hours of activity to honor those with Alzheimer’s and their caregivers. My father was diagnosed with early-onset (also called younger-onset) Alzheimer’s late last year. There is a hereditary mutated gene that runs in our family that has also affected my dad’s father and his sister. The grandfather of my teammates, Alissa and Erica, also has Alzheimer’s. The four of us decided to form team “Fighting to Remember” and join The Longest Day to honor these two amazing men. Now, I’m getting ready to undock the pontoon on Lake Wisconsin. We plan to boat for a while and park at the sandbars to play cards. My dad has spent his whole life fishing and he loves playing cards. The same is true for our friends’ grandfather, who grew up in Chicago and moved to his house on Lake Wisconsin 35 years ago. Tonight, we will dock the boat and have a huge celebration with our families, grilling a pork shoulder and talking about our successful day. 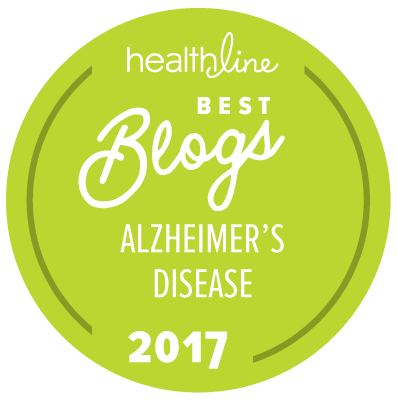 We are so honored to be a part of this event and are amazed at the number of people who have come forward to share their stories and struggles with Alzheimer’s. I am grateful to have such a strong dad. He has known that Alzheimer’s disease would likely affect him due to the hereditary mutated gene and has lived his life to the fullest because of it. We are making plans to travel over the next year so we can continue to make memories while he is strong enough to do it. Unlike most people my age (I’m 33), I choose to live with my parents, along with my 2-year-old daughter, Lauren. This way, we can help my dad and continue to make memories. I am so grateful for my wonderful family. My sister, Rochelle, is right down the street. Almost every night we get together as a family. I’m also so glad I can help my mom with emotional support during this time. We are best friends, and I love living with them. Our team has raised more than $7,200, but our efforts will not end here. We will continue raising awareness beyond today. 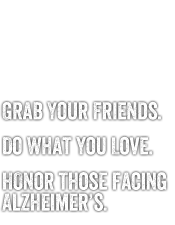 We are in it until Alzheimer’s is just a distant memory.